A couple of weeks ago I was well overdue a catch up with my sister having not seen each other since before Christmas! So I drove down to Clapham and stayed the weekend. 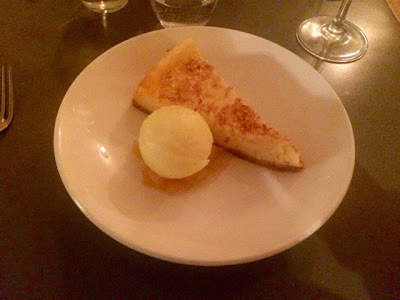 When she suggested we go out for a meal locally as she lives a short walk away from Abbeville Road (well known for it’s foodie delights) I jumped at the chance to review a restaurant outside of my usual central London as it makes a really nice change. As much as I love central London dining, there’s something about more local restaurants that’s just a bit calmer and more relaxing. Having been emailed a list of restaurants to choose from I opted to try out Bistro Union, the latest restaurant from Saturday Kitchen regular Adam Byatt. A relaxed Bistro environment, the restaurant is quite small and busy providing it with a good atmosphere without feeling overcrowded with a small bar area where you can have a few drinks if you’re waiting for a table. 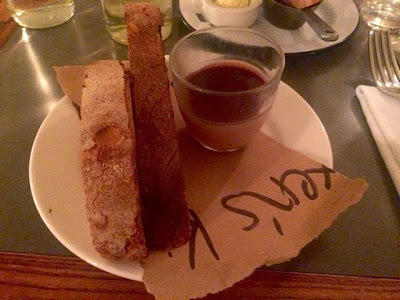 We both kicked off the evening with the chicken liver pâté which came with two enormous chunks of crusty bread. The pâté was very smooth and creamy and the dish was very well proportioned, I always hate it when you’re not given enough bread for the pâté and you end up wasting some of it. This was pretty much exactly the right amount of bread for the amount of pâté. After much debate about whether to have it as a starter or a main course my sister had the mussels for her main, which were very impressive indeed. Big, plump and juicy and loads of them with plenty of proper big chunky chips for dipping I had serious food envy and will be coming back just to order these for myself. 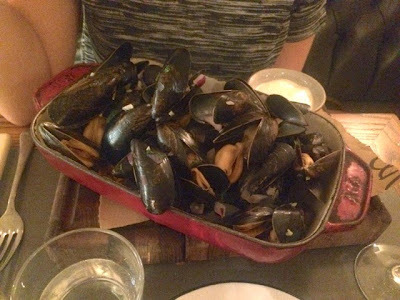 Thankfully I did get to sample the delights of these big juicy mussels myself as three of them were nestled invitingly in the top of my fish pie. Yes I did greedily gobble down two before I remembered to take a photo, I just got too excited about the mussels. Fish pie was a really nice sized portion, it wasn’t huge which meant it was really manageable and didn’t leave me feeling stuffed and bloated afterwards. 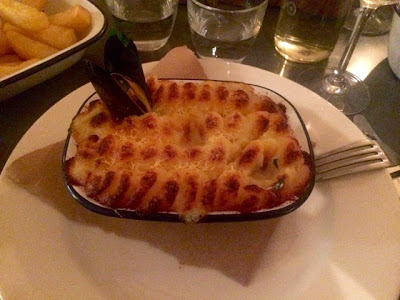 I often find when you order a fish pie you get enough for two and then you really regret it afterwards. this pie was just right and stuffed full of lot of lovely salmon and some sort of white fish. As the type of fish isn’t specified on the menu I imagine this might change depending on what’s most readily available. Overall, a really tasty British classic. I wasn’t overly excited by the dessert menu (but then I never am) but we decided to share the coconut cheesecake with pineapple as it sounded like something a little bit different. This was one of those really exciting moments where I really admire chefs for their imagination and ability to pair flavours as individually everything tastes good but when you have a mouthful incorporating a little bit of each element all the flavours come together so beautifully you can’t possibly imagine why you’d ever want to separate them. A very well executed dessert. Bistro Union was a really good example of ‘modern British’ cooking. It wasn’t like pub grub but then the classics also hadn’t been messed with so much that they’re unrecognisable. Every dish was a really good up to date and fresh example of good British classics, fresh enough to elevate it above the ‘same old’ but recognisable enough to relish in the comfort food factor. One of the stand out points of the evening was the service. I’ve generally been a bit disappointed with service I’ve received in London restaurants of late so I was really pleased to see not everyone’s forgotten the importance of a friendly smile and knowledge of the menu. All the stuff were really friendly, knew the food and provided a really relaxed light-hearted welcome without being over bearing at all. At a five minute walk from my sister’s flat I think I might have to move in so I can go back to Bistro Union for a giant bowl of mussels more often!